53,000. That is the number of young adults ages 16–24 in San Diego County who are NOT in school or working. This is a shocking statistic — and one that must change. The story is not final, but we must act now to flip the script from “disconnection” to “opportunity.” These are opportunity youth. When we engage young people through jobs, school and community, we all win. When we don’t, the long-term impact is devastating on every level. Flip the Script: 53,000 Reasons to Change the Story of San Diego’s Opportunity Youth addresses the disconnection crisis and focuses on solutions. 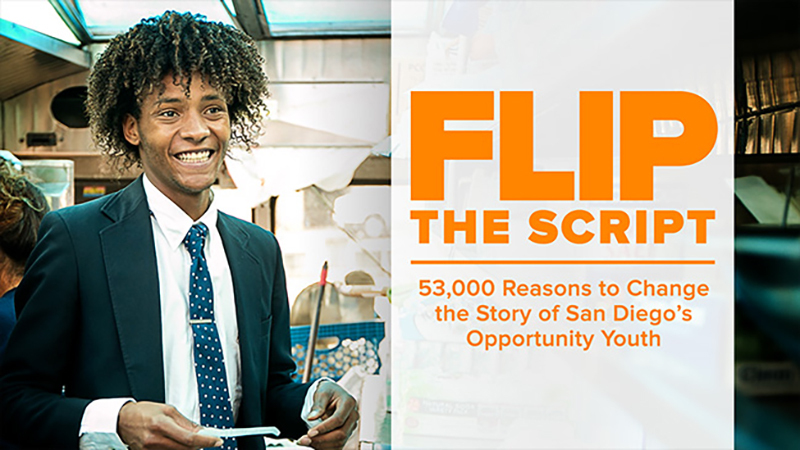 Watch Flip the Script: 53,000 Reasons to Change the Story of San Diego’s Opportunity Youth. Previous Previous post: Join us on Science Field Trips to Lawrence Livermore National Lab!